Got behind. But I’ve been sick for about a week and a half now. Stupid cold refuses to go away. Then I had car troubles. So between all that great stuff, I’ve been lucky to get what I have gotten up. We open episode nine with a bloody an beaten Woo Joo returning home and collapsing on the street sending a panicking Luna rushing up to him. At this time Sung Jun comes out and Luna tells him to call 119 (Asian equivalent of 911). Woo Joo tells them there’s no need and the two help him into the house. Luna takes care of him and Sung Jun asks how he’s doing. Luna says the wounds don’t seem too bad and he had just fallen asleep. Sung Jun leaves and Luna notices the jewelry box in his drawer. Before she can open it, Woo Joo cries out in pain. Would Luna recognize the necklace that he has if she saw it? Meanwhile, Ren is completely wasted. There’s empty alcohol bottles littered all over his apartment. He collapses to the floor and recalls Luna telling him that they should break up. He takes out his cell and desperately tries calling her. No answer. He tries again. No answer. And one more time, still no answer. He angrily throws the phone down the couch. Well, at least he didn’t smash a perfectly good phone against a wall or on the floor. Anne wonders why Luna isn’t answering the phone. We see all the calls are from Ren. Anne then jokes around and asks if they broke up. Anne is shocked when Luna confirms that she and Ren did call it quits that night. How shocking! Ren is like the ultimate boyfriend. Anne had thought the two would be definitely be getting married in the near future. Luna smiles and tells her not to feel bad about it. Anne’s depressed as she was hoping for a Cinderella story. Luna says it was more like being in love with love and wanting something to envelope her. Anne believes Luna made the best decision and then says that they are all at a turning point right now. What is with Sung Jun always lurking around and eavesdropping on every conversation? Luna is washing up when Woo Joo enters. He apologizes and goes to leave, but Luna immediately asks how he is doing. Woo Joo assures her that he is fine and thanks her for the other night. Luna then demands to know how many fingers she’s holding up. She starts waving two back and forth and Woo Joo comes up and smiles. Two. He wasn’t hurt that badly. Does he know who did it? He wasn’t fighting was he? Woo Joo doesn’t know and he wasn’t fighting either. He then opens the washing machine and sees a T-shirt like the one his attacker was wearing. We flashback and get to see Woo Joo’s beating and his attacker telling him he’s in danger and to go back to Korea. 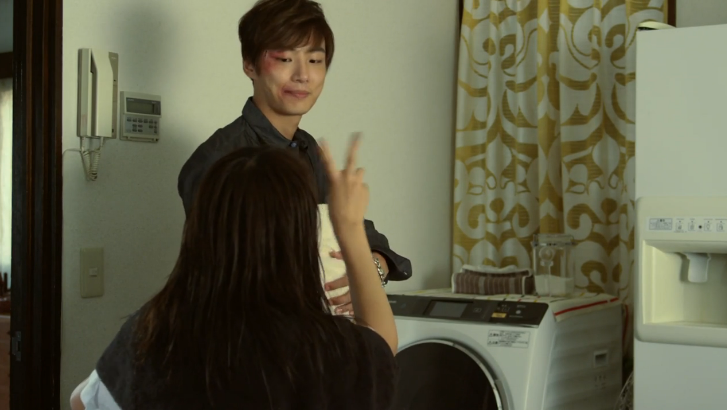 The flashback ends and Woo Joo asks whose clothes are in the washing machine. Sung Jun’s. Woo Joo can take them out to wash his. Poor boy is in a state of shock. He would never have guessed one of his new friends would be his assailant. Luna leaves and Woo Joo rushes after her. They should go to work together. When he winces in pain, Luna asks if he shouldn’t go to the hospital before work. Woo Joo won’t, plus he is more worried about Luna. She stayed up all night taking care of him. Will she be okay? Luna tells him she’s used to pulling all nighters. She then scolds him as she is very worried since he’s not talking about what happened. Woo Joo tells her to focus on the Numero project. That’s right. Luna has decided she isn’t going to give it up after all. Good for her. Of course, Misaki is NOT happy that Luna isn’t going to drop out of the project. Misaki says that having Ren on Luna’s side has given the younger girl guts. Luna says that isn’t the case and that she and Ren do not have that type of relationship (not any more anyways). Misaki says even if that is true, it doesn’t change the fact Ren was the one who recommended Luna. Misaki says that she still won’t accept Luna’s position since it wasn’t earned by a lucky windfall. Enter Abilio and Ren. Windfall? What is Misaki talking about this time? Anywho, it’s time for the meeting to start. Luna wishes to focus in on natural and inner beauty and not just outward appearance. They’ve already received the models lists from major domestic agencies. For the men’s line they are hoping to use a male actor versus a model. Any questions? Ren isn’t happy that Luna hasn’t named a particular male actor at this stage of the game. Plus, using an actor to launch the men’s line seems risky. Luna keeps her cool and tells Ren to discuss that more with the two fashion magazines as it is up to them to determine market research and target audience. She then shocks everyone (and I think impresses Misaki) with her cool command to tell Ren to back off and leave the PR to them. Wowza. Good going Luna! Abilio even comments that Luna seems like another Misaki with this attitude. Misaki grumpily says it is all a farce. Meanwhile, evildoer #1 is unhappy to learn his plot may be on the rocks thanks to Luna breaking up with Ren. Didn’t they have Ha Woo Joo attacked? Well, the plan was a bit weak to begin with. Evildoer #1 says this is because #2 didn’t follow through well at all. #2 apologizes and says he will figure something out. Kind of sad to think Sung Jun is wrapped up with the baddies. Oh well. Meanwhile Woo Joo is working hard and being teased by Taka for looking like a Korean actor (probably in reference to looking like himself, lol). Who is this man? None other than Ren! Needless to say Luna doesn’t look so happy to see him when she and Woo Joo arrive. Awkward atmosphere to the max! Luna basically ignores Ren and worries over Woo Joo. He shouldn’t drink too much since he’s injured. Woo Joo assures her he’s fine and tells her to go lightly herself as he can’t handle her going crazy on him again. Luna says she doesn’t act crazy. 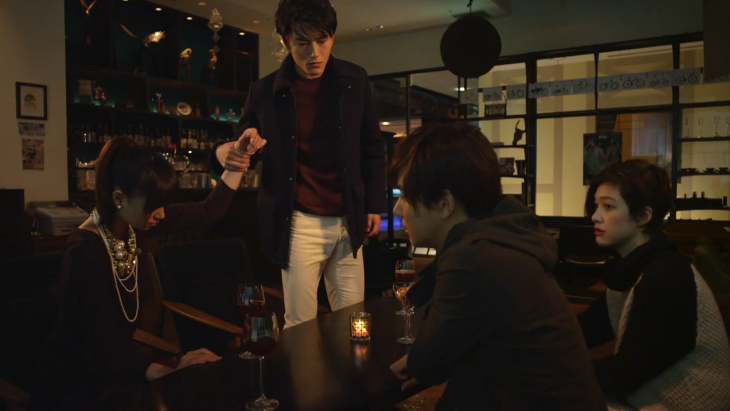 Woo Joo says he’s still injured and can’t piggyback her and goes to take her wine away. Luna stops him and Woo Joo winces in pain. See? He’s still not well. Ren Jumps up and grabs Luna’s arm. He needs to talk to her. Woo Joo, wincing, tells him to talk to her there. Ren doesn’t listen and drags her off. Anne is worried. Woo Joo might not know, but Luna broke up with Ren. Him going off with her can’t be good. Woo Joo asks if Anne can make it home by herself. 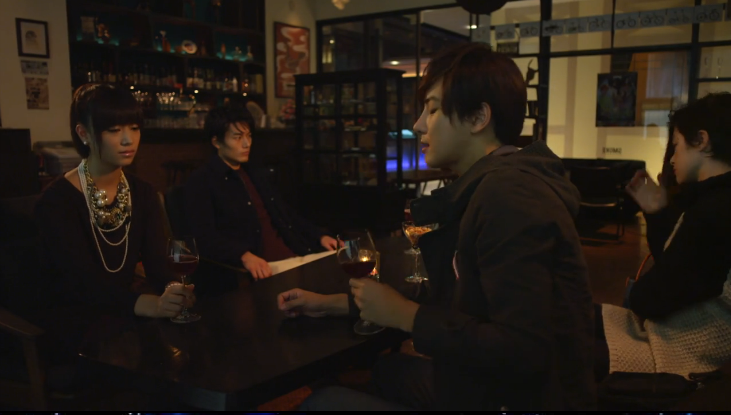 Anne nods and Woo Joo downs his wine in one shot. Looks like he’s setting himself up to play the hero, which hopefully won’t result with him taking any more punches. 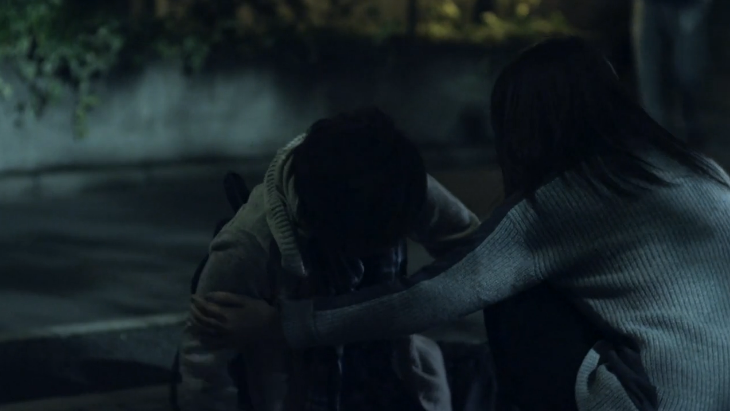 Ren drags her outside and says he’s sorry, but he can’t take anymore. Before his feelings change…he then tries to pull Luna into a kiss. She tells him to stop and leave her alone for now. Enter Woo Joo. It’s time to go home. But they are still talking. Woo Joo says it looks like Luna has nothing left to say and he drags her off with him leaving Ren all depressed and alone. What is with poor Luna getting dragged around by the men in her life? Outside, Luna starts to tear up. It’s not that she doesn’t like Ren, but at this rate she will die of suffocation. She drops Woo Joo’s hand and calls herself a horrible person and starts sobbing harder. Woo Woo does his best to comfort the crying girl. She’s not horrible. In relationships, if it’s uneven, even if there’s love, it won’t work out and someone will be unhappy and smothered. At least she finally stood on her own two feet and walked away before love can turn to hate. I’m a horrible person, ne? We then end with Ren posting on Facebook that he can’t live without her and asking her to marry him soon. Phones start ringing. Seriously? A Facebook proposal? Ren is a major baka. Of course, this will help our evil doers get what they want as you know daddy won’t like what his son has done which could result in negative feedback for their company.